In March 2018 we exhibited at TEFAF Maastricht. Around 68,000 visitors from over 60 different countries were welcomed during the course of this highly successful fair. 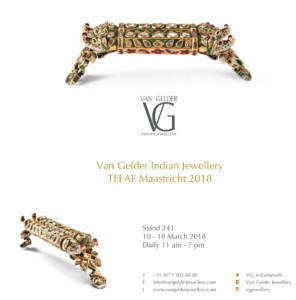 Accompanying the invitation kit for TEFAF Maastricht, we treated our guests with ‘arm candy’; an exclusive publication, dedicated solely to traditional Indian arm Jewellery. We loved working on this special project and are very pleased with the outcome!